Delight your senses with accompaniments you have available. Hummus is great as a dipper. 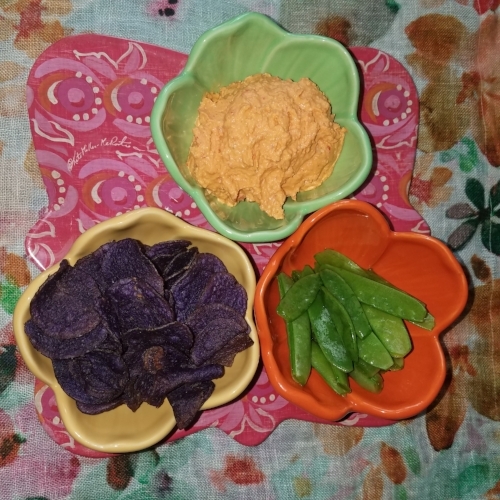 Try it as a side on your salad plate and enjoy any bite with the healthful addition of sweet red pepper hummus. It’s also a good spread for a wrap or toast. One whole roasted sweet red pepper with seeds scraped off. I use an organic jarred variety. Blend garbanzos, garlic, lemon juice and tahini in food processor until smooth. Add spice to taste and gently blend. Serve with crudite’ (raw vegetables) or whole grain, sprouted or rice tortillas. Tortillas can be heated on baking stone at 350 degrees for about five minutes until crispy and broken into chips for a truly baked chip. It is also good on toast for breakfast. Sprinkle with sprouts or sunflower seeds. Hummus travels well in lunch boxes. It refrigerates well for a few of days. Contact Tam for a 15 minute complimentary conversation to discuss your wellness goals and where you are stuck. Find out if her approach is a fit for you.